If you notice any of these tools is not working with recent versions of diaspora* anymore, please remove it from this list and/or leave a message on the talk page. If you know the author of the dead tool you can also notify them directly, so they can possibly update their tool! If you're looking for information about how to add Diaspora* related functionality to your web site, you might want to look at the FAQ for web developers. Share Service for Firefox Service to be used with the browsers build-in Social API. Diaspora* Advanced Sharer Addon to share the current page to any Diaspora pod. Grabs title, URL and selected part of page which is converted from HTML to Markdown (images, lists, urls, etc work). Diaspora* Publisher - Allows you to share your favorite pages with your friends; you can also select and share a specific part of the page. 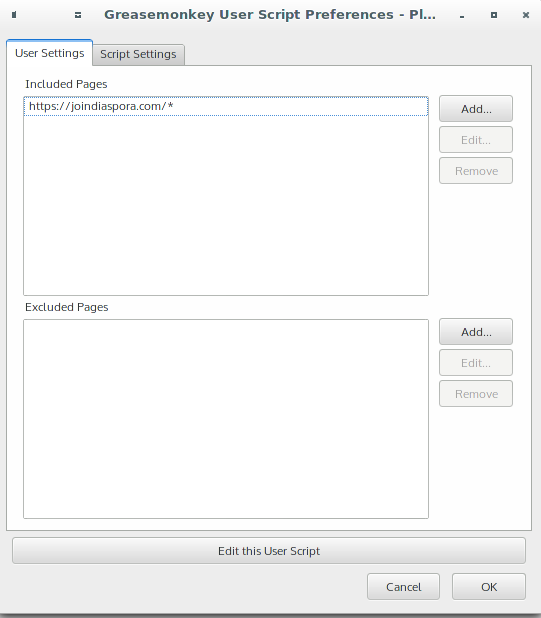 These scripts require a userscript manager, such as Greasemonkey (Firefox), Tampermonkey (Chrome), or equivalents. Greasemonkey scripts will work immediately on several pods, but not all. You may have to add your own pod to the list of "Included Pages" (in Settings). Cross-pod Links - Click a Diaspora post's permalink to copy a server-relative URL to your clipboard. Makes it easy to write links in your Diaspora posts that will work across pods when the people you are sharing with are on a different pod than you. It's All Text! - (Firefox add-on) Opens your desktop text editor from any text box, so you can easily format and include images, links, etc. Saving the document sends the code to the text box, no copying+pasting required. Copy as Markdown (Chrome & Firefox). A right click provides a formatted web page link or the code to embed an image. Use Addpodsavelink (above) for diaspora posts. Markdown Pad - (Windows, browser-independent) A popular Markdown editor. ReText - (Linux, browser-independent) A simple but efficient PyQT based Markdown, ReText and HTML editor; includes live preview. Toggle animated GIFs (Firefox add-on). Disable GIF animations by default. Dandelion - Android client that adds a bunch of features. Available on the FDroid app store. dia.so - A profile shortener so people on other pods get you on their pod and A url shortener all pod admins can use. Diaspora Reshare Graph - A D3.js implementation of Reshare Visualizer, includes handy bookmarklet for Single Post View. Diaspora Source Finder - A Bookmarklet for the Single Post View to source the originating server and thread. Works across diaspora and compatible networks. Unicode Character Table - Not specific to Diaspora but a very hand for including Unicode like ★ ☂ ☯ ♫ ❤ in your diaspora posts. PicUp - Free Image / Photography Hosting Platform (with some Diaspora unique features - like sharing or generating markdown links). Comes with an easy API and the Karma reputation system. Diaspora* Advanced Sharer - To add a "Share on diaspora*" button to your website. Diaspora* Simple Sharer - To add a simple "Share on diaspora*" button to your website. Diasposter -- Diasposter cross-posts your WordPress entries to Diaspora. Changes to your WordPress posts are reflected in your Diaspora posts. Share on Diaspora -- adds a Share on D* button at the bottom of WordPress posts. Webfinger Profile Plugin for 'Join me' widget -- displays a widget on your WordPress blog with your profile information from Diaspora, more info. Unsupported, last updated on 2011-9-23. Wordpress plugin: wp-post-to-diaspora when you make a new blog post, this plugin will post a link to it to your diaspora account. Abandoned, last updated on 2011-9-30. Sociable -- a WordPress plugin customized for share content also on Diaspora*. In latest versions, Diaspora support was dropped. diclish - CLI bash script for posting/reading on Diaspora*. diclipy - CLI Python script for posting/reading/commenting on Diaspora* written around Diaspy API. Diaspora Tools - Python pod2pod contacts and aspects migration script. From RSS To Diaspora* is a bash script that makes use of the cliaspora programmer tool. rss2diaspora-hs is a Haskell implementation of an RSS bot. feedDiasp* let's you publish posts from facebook or an RSS-feed to Diaspora*. If you want to change your Pod you may need a list of your contacts. This shell command may be useful for you. Export your Data via "Settings - Account - Export Data - Profile" and rename this file to "d-exported-in.json.gz". You'll get the file "d-contacts-out.txt" which is a list of all your contacts. This page was last edited on 7 April 2019, at 07:01.